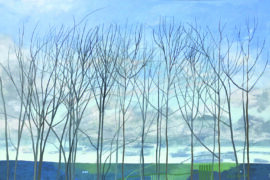 Three contemporary painters and a potter all working in the landscape. Malcolm Ashman, Andrew Lansley, Bridget Mcdonald and James Campbell are all highly respected artists whose works are held in both public and private collections. Their common ground, though not immediately apparent, is drawing and composition. The paintings are carefully constructed and considered, as are the ceramics of James Campbell whose light, sensitive drawings work well with the larger scale charcoal drawings by Bridget Mcdonald.